We provide custom, luxury, private trips to Stingray City, Starfish Point, the Bioluminescence Bay and more. If you want to avoid the crowds, and experience the natural beauty of Cayman then join us. From our Owner/Operator care, to our knowledge and service, you will have a day to remember with us. The beautiful Cayman is the most famous Caribbean getaway for both relaxation and adventure seeking commuters. There are near about 1000 species of fishes in the Caribbean Sea. Divers and snorkelers will come across wide range of fishes in the sea of Cayman Islands (Cayman Brac, Grand Cayman, and Little Cayman) like scorpion fish, large silvery tarpon, French angelfish, and glittery silversides. 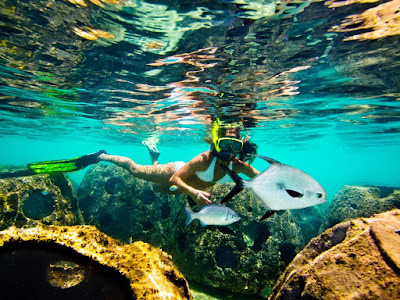 Enjoy cayman snorkeling tours and grand cayman barrier reef snorkeling in Cayman Island. The Cayman Islands snorkeling and diving is an excellent way to swim with some of these exotic creatures to discover beautiful marine life underwater. These marine inhabitants will surely offer you thoughtful memories that you will treasure when you return home. Diverse marine life that you will encounter in the sea further enriches your holiday. The calm waters surrounding these reefs are ideal for families and first-time anglers who are eager to lurch in a colorful surprise. Common fishes that thrive in the ocean of Grand Cayman islands include Blue tang, French Grunt, Squirrelfish, Needlefish, Sergeant Majors, etc. Know more about grand cayman marine life. There are also many reef fish in Cayman near shore. Stingrays, sponges, corals, octopuses, reefs, angelfish, shrimps, etc-all are ready to pose for the ideal picture shot for the family album. Do not forget to bring a waterproof camera with you. Blue Tang ranges from light blue color to dark and almost black. They are usually oval-shaped, and you will spot them in big groups when you snorkel. French Grunt is another common species found in the Caribbean. They have silver and yellow striped bodies and are easily available. Needlefishes are shallow marine fishes that are skinny and long. They have a silver color. Tarpon/Snappers are small silver fishes that are smaller varieties found underwater. Bluehead Wrasses are small colorful fishes that you will easily spot around coral reefs. Private boat charters grand cayman. They live for only two years. When they are in their early stage, they are in yellow and white. But slowly they turn in blue as they age. So what're you waiting for, come and dive in the warm water sea of Cayman with your scuba gear to explore the rich marine life? See bio bay grand cayman map. You can also hire the best Bio Bay charter Cayman to experience the gorgeous light show. It’s never too late to fall in love with the beautiful nature.